Nigeria has achieved impressive economic growth between 1999 and 2010, as the economy grew fifteen fold from US$36 to nearly US$555 billion, according to “The 2012 Gender in Nigeria Report by the British Council, Nigeria”. The report states that the figure of US$555 billion “may even be an underestimate, because they do not include the informal sector, where women are concentrated, which makes a substantial contribution to national wealth creation”. The World Bank 2011 report, states that Nigeria “has been catapulted into the global club of emerging middle-income economies”. The Wall Street Journal (WSJ) article titled “Nigeria Counts on Business in Bid for Economic Crown” states that the International Monetary Fund (IMF) estimates that Nigeria's gross domestic product (GDP) totals $244 billion, second on the continent to South Africa's $409 billion economy. This figure differs from UK Trade and Investment figures which put Nigeria GDP estimate at $273.04 billion in 2011. The last Business Census conducted in Nigeria was in 1990, when Nigeria only had a few thousand land lines; as of 2012, there are more than 100 million mobile phone lines according to the WSJ. The data also overlooks Nollywood, Nigeria's film industry —which did not exist in 1990, but is now the world's third largest and the rapidly growing Nigerian music industry, according to the UNESCO Institute for Statistics and UK Trade and Investment (UKTI). The Business Census currently undertaken by Nigeria's National Bureau of Statistics, led by the Statistician-General, Mr Yemi Kale, will provide an indication of the number of formal and informal businesses in Nigeria. The result of this survey could reorder economic hierarchy on the African continent and is expected to be published in 2013. This entails 2,600 field surveyors venturing into crowded markets and creek side villages to bring local business owners a six-page questionnaire on their profit and expenditures. In light of the economic indicators currently available and given the informal economy, the economic growth of Nigeria place the nation significantly ahead of South Africa as the largest and number one economy in Africa. Nigeria Magazine now estimates Nigerian economy to be the largest in Africa ahead of South Africa and to have overtaken South Africa officially by $146 Billion. According to WSJ, the rest of Africa is outpacing South Africa. 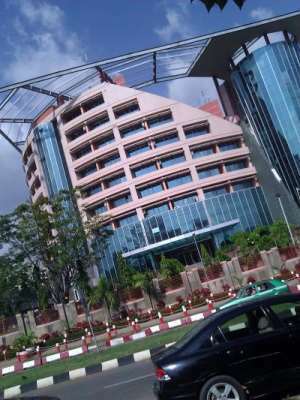 Growth on the continent is set to average 5 per cent this year, and 7.1 per cent in Nigeria, the IMF said. South African officials see their economy growing 2.5% this year, but in the recent quarter growth skidded to just 1.2% after a wave of strikes crippled mines and shut some factories and farms. "U.S. businesses watch these things on the news," acting U.S. Commerce Secretary Rebecca Blank told reporters during a November visit to South Africa; "it affects their view of whether South Africa looks like a place to bring their next investment." South Africa's ruling African National Congress did little to dispel their concerns this month, as it announced plans to levy new taxes on mines and consider more state ownership of the economy "when deemed necessary and based on the balance of evidence." The National Population Commission stated that Nigeria's population has risen from 140, 431, 790 million five years ago (when the last national head count was taken) to 167,912,561 as of October 2011. Time Magazine in 2012 states that Nigeria currently boasts 166 million people but by 2050, its population is expected to jump to 402 million. The US Census Bureau Survey report has revealed that by 2050, Nigeria will become the world's fastest growing population and to remain one of the top ten population powers in the world. Others estimate the population as (162.5 million in 2011, UNFPA); and (170,123,740 July 2012, CIA World Factbook). This makes Nigeria the most populous nation in sub-Saharan Africa. One in every four people in sub-Saharan Africa lives in Nigeria. Therefore, Africa's development prospects are intrinsically tied to what happens in Nigeria. South Africa's demographics consists of about 50 million people of diverse origins, cultures, languages, and religions according to the 2011 census. Though the population of South Africa has increased in the past decade (primarily due to immigration), the country had an annual population growth rate of -0.051 per cent in 2010 (CIA estimate). The African Development Bank (ADB) African Economic Outlook for 2012, estimates Nigeria's economic growth at an average of about 7.4 per cent annually over the past ten years and this will remain robust in 2011 at 6.9 per cent driven by the non-oil sectors such as telecoms, construction, wholesale and retail trade, hotel and restaurant services, manufacturing and agriculture. Other growth industries include: oil and gas; power; healthcare; financial and professional services; ICT; transport; education and training. Growth is projected at 6.9 per cent and 6.6 per cent in 2012 and 2013 respectively. The government is expected to reach its target of getting inflation under 10 per cent in 2013. The inflation rate fell from 13.7 per cent in 2010 to 10.2 per cent in 2011 following monetary policy tightening and the easing of food prices. Inflation is projected to ease to 10.1 per cent in 2012 and 8.4 per cent in 2013. Nigeria's middle class accounts for about 23 per cent of its population (nearly 40 million people) according to ADB data. The Renaissance Capital Survey was conducted with 1,004 middle class Nigerians residing in Lagos, Abuja and Port Harcourt, 70 per cent of whom were aged 40 or younger. Various findings on Nigeria's middle class are as follows: average monthly income is in the range of 75 to 100 thousand naira or roughly 6000-7000 dollars per annum; well educated of which 92 per cent have obtained post secondary education or have studied at an institution of higher learning; a sizeable proportion of those sampled (76 per cent) work in the public sector; hunger for knowledge and top priority on good education for their children; with over half (upper and middle class citizens) keen to send their children abroad for a better quality of education. The middle class has a culture of savings and care little about the deposit rate and do not expect to borrow from a bank. If they had the funds, they would rather invest in land/property than shares or bonds. Most do not have mortgages (which represents approximately 1 per cent of GDP) or credit cards, although many expect to apply for the latter. Projections about Nigeria's economy indicate its economic growth exceeding that of South Africa for the foreseeable future and it's now up to the government in Nigeria to ensure the sustainability of such.